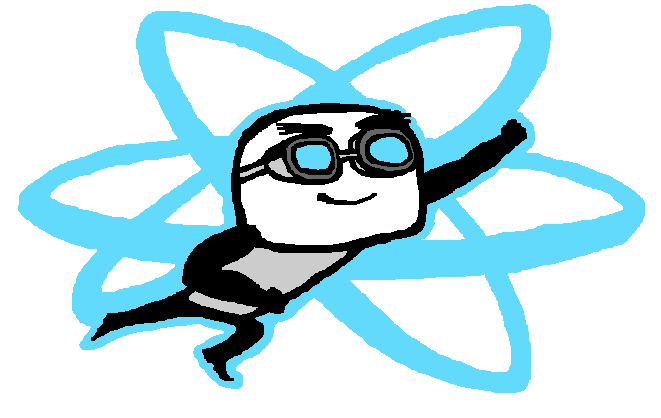 I’ve been trying to learn React.js in my spare time over the past month. We have a large project using the technology and I thought it would be a good idea for me to at least know the basics. When I asked how I should begin, my team suggested I start with the tutorial here. This was a great introduction and helped me get an idea of how to create a basic React.js application. We all learn in different ways, and one of the ways I like to learn is through baby steps, learning each new thing in small increments. To do this, I thought I would try to build an application using the technology for a business problem we were facing. We use Unfuddle for project management and source control on many of our projects. Unfuddle is a great tool and does many great things for a low cost point. When it comes to reporting on source and ticket management, it does a pretty good job. The problem is when it comes to reporting on “activity”; it is pretty limited when using the user interface. Fortunately for us, Unfuddle provides an API we can use to get activity data by date for a project, then we can add filtering of our own to find the data we are looking for. The use case for this came when coming to the end of a very busy “sprint” for a developer where he had fixed a dozen tickets and built several new features. We couldn’t figure out an easy way to find all tickets that were resolved or closed by a given developer during a sprint time period. The minimal goal of this project is to be able to provide this information. React takes a component based approach to building interfaces, so the first step in building a React.js application is breaking down the application into components. For my application, the first thing I need is to provide the Unfuddle API with the information necessary to fetch the data. This includes subdomain, user, password, project ID and a date range. I will call this component the “ItemForm”. Once I have that, I need a way to filter the activity items by action type, and user, and finally a way to look for the “completed” tickets. I will call this component the “FilterForm”. I also need a table to list all the results from the query and filter requests, this component will be the “ItemList”. Lastly, I need a component to hold all the other components inside of them, I will call this the “ItemBox”. See figure 1 below for a diagram of my components and how they are laid out. index.html – this is our main html file to load our dependent js files as well as our application file. css/base.css – this is our css file to make things look nice, we also use bootstrap.css to make things look nicer. scripts/unfuddleactivity.js – this is our application code, where all our React components live. Let’s start with our index.html file. See the comments for each of the included files and why we included them. This gives us a working React.js ecosystem and we will now focus our attention on the unfuddleactivity.js file. When we crack open this file, you will notice it is pretty big (424 lines), bear with me for now on this, we will fix this in a future article. Each component listed in figure 1 is in this file along with the code to make this component work. I am going to walk you through select parts of this file where I felt I had to learn something to implement the code. For the vanilla React.js stuff, you should have learned this in the tutorial and will be skipped. Feel free to review all the code and send me questions. Let’s start by looking at the end of the file first. Here we will find our ItemBox component and it is responsible for rendering all the other components which are contained inside of it. This code is pretty simple, it is just setting the property “url” for the ItemBox component and rendering the results of the ItemBox into the content div. loop through the results and get all the unique people IDS. for each person ID, make a call to Unfuddle and get their name, save this name in an object hash. We are using a promise to resolve the .ajax call. This will allow us to put step 2-4 inside that promise “then” block. Since we are making a bunch of AJAX calls in step 3, a single promise is not good enough, so we need to use an array of promises. This allows us to create each call with a promise and then store them in an array. Then, we can use the Promise.all function which takes an arrayOfPromises to wait for all of them to complete before we finish with step 4 and set the state. To get a unique set of person IDS, just put them into an object hash, which allows you to have a Hashtable, and then get the keys out. Getting the keys out seems very weird to me compared to other OO languages, but it works fine. There are a few things I had to learn when doing this form. The first is doing tables inside of React. Tables work just like HTML tables, but React will force you to define them correctly (with thead and tbody). The other thing to notice is to give any React element a style we use “className” instead of “class”. 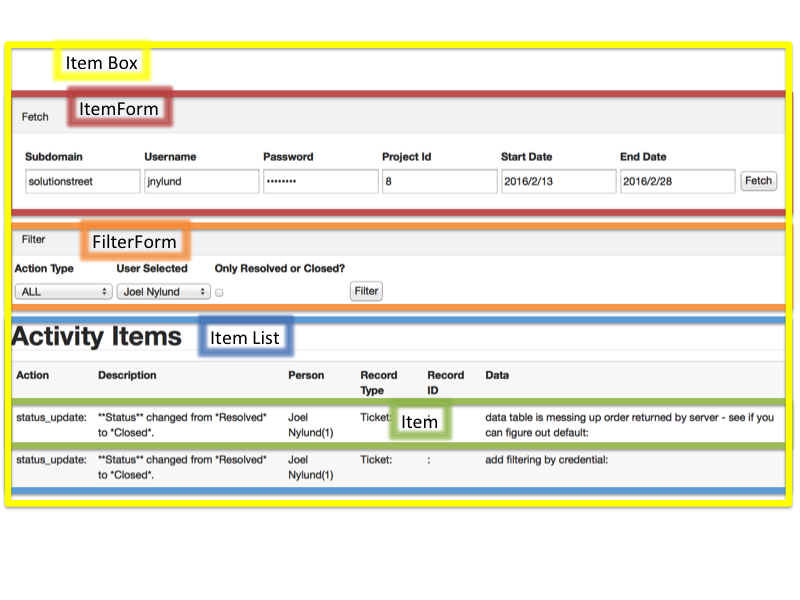 Now we have our “FilterForm” all set and ready to go, I want to talk about some challenges I faced when doing the “ItemForm”. Fortunately, I found out that moment.js has all the same great methods as Ruby & Rails for date/time and formatting. To keep my app simple, I am not adding moment to it yet.